More information about the Islands in the Sun 2013 Mini Wall Calendar. 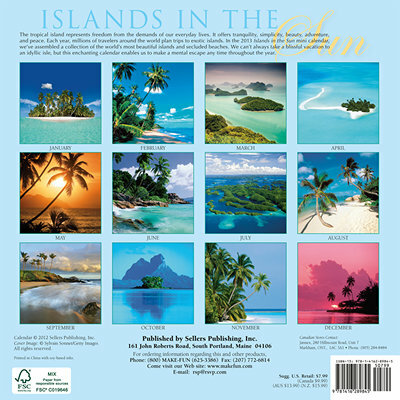 "Islands in the Sun Mini Wall Calendar: Enjoy photographs of some of the world's most beautiful uninhabited tropical islands, where peace and tranquility reign. This enchanting calendar offers a ""mental escape"" any time during the year. UPC: 764453089844 EAN: 9781416289845"